Hyderabad (VSK). When other ancient civilizations like Persia, Egypt, Rome have been decimated, Bharat rose like a phoenix from the ashes, thanks to the renaissance of the Hindu society from time to time. Now the entire world is looking up to Bharat to help it come out of the quagmire of violence and consumerism, said Dr. Krishna Gopal Ji, Sah Sarkaryavah of Rastriya Swayamsevak Sangh at Vijayadashami Utsav organised by RSS Bhagyanagar on Sept 24, 2017 at NTR Stadium grounds, Hyderabad. He said the Vijaydashami signifies victory of good over evil. The clash between the evil powers and the civilized powers is perennial, but evil looks powerful primarily because it has been always tough to unite positive forces. In our civilization all power manifests in form of “stree shakti”. Dr. Hedgewar Ji founded the RSS on the Vijayadashami day in 1925 in Nagpur. It has been working relentlessly for the last 92 years to consolidate the Hindu society and thereby usher a glorious era of prosperity of the nation. 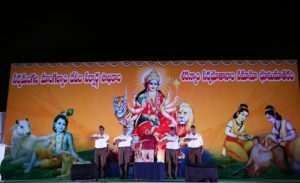 The RSS activities are running at over 80,000 places in the country and the Sangh swayamsevaks are involved in over 1.7 lakh social service activities. Due to relentless work of the Swayamsevaks today we see Independence Day and Republic Day now being openly celebrated with pride even in the North-eastern states which have been for long suffering violence due to the separatist forces. But the path has not been easy for the Sangh Swayamsevaks. More than 400 Swayamsevaks have been killed in Kerala, Tamilnadu and Karnataka. Till now 35 Swayamsevaks have been killed by anti-national forces in Kerala alone this year. Talking about the separatist language being spoken by a section of the minorities, he recalled the words of Sardar Patel who said that a community which is capable of partitioning a nation cannot be called a minority. He had categorically stated that post-Independent India will not have religion- based reservations. 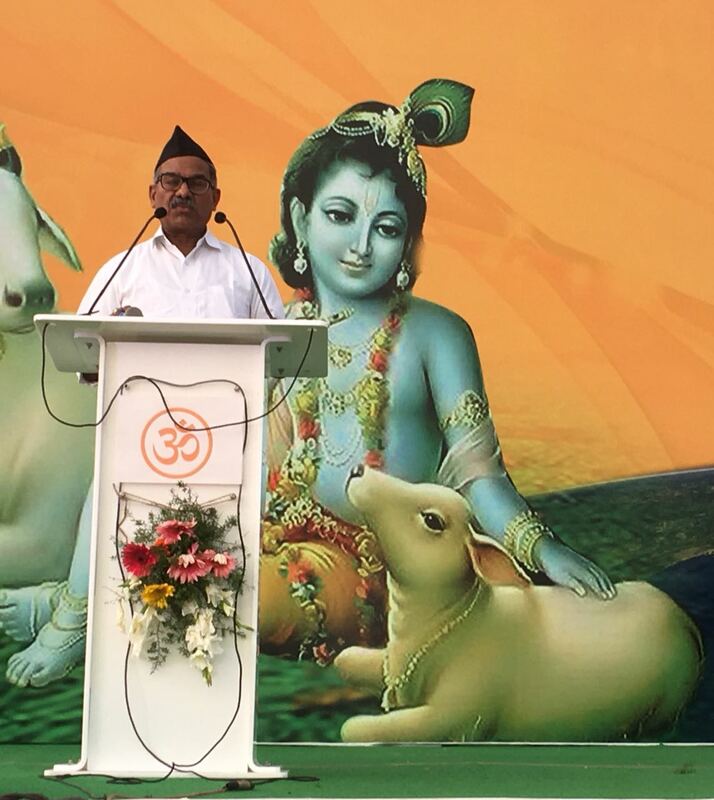 Sah Sarkaryavah Ji urged the Swayamsevaks to reach out to all sections of the society and eradicate all forms of discrimination. Such a society will be a beaconlight to the entire world which is struggling with various issues of harmony. Chief guest of the program Vinod Kumar Agarwal Ji, IAS (Rtd) appreciated the disciplined turnout of the RSS swayamsevaks and said green shoots of glorious future after thousand years of foreign rule are now visible and lauded the role played by the RSS in bringing such decisive and positive changes in the society. 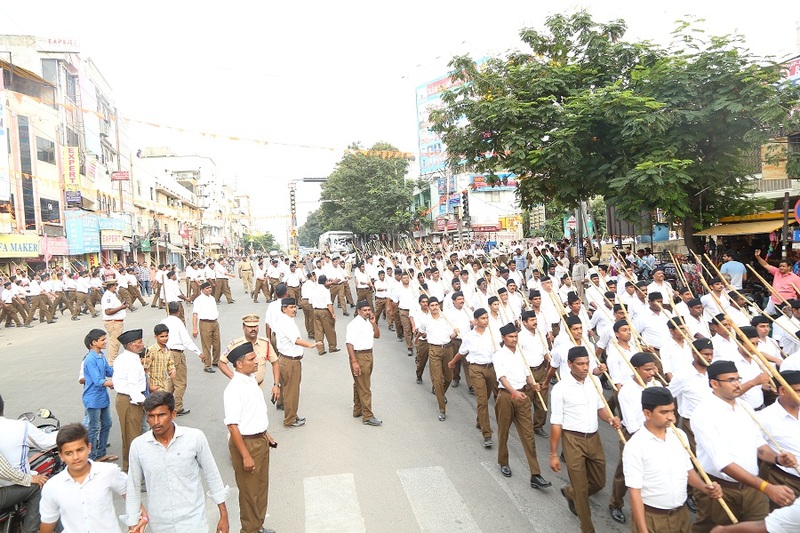 Swayamsevaks from all the shakhas in the city gathered in full uniform to celebrate the Vijayadashami Utsav. Over 10000 swayamsevaks participated in Sanchalan (route march) of over 4 kms. 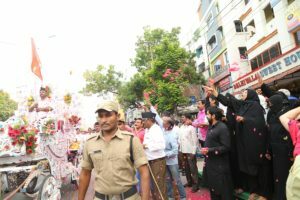 In addition, thousands of people from all over the city came to witness the event.